Catina Caudill; photo courtesy of Bartholomew County Sheriff’s Dept. A Columbus woman is facing charges after she allegedly refused to leave an area business. Just before 6 p.m. Wednesday, Bartholomew County Sheriffs Deputies were dispatched to a convenience store at the intersection of N US 31 and W 650 in Taylorsville, after dispatch received a 911 hang up. 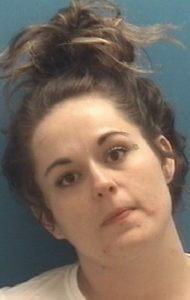 On arrival, employees told deputies they had asked 28-year-old Catina Caudill to leave the store multiple times but she refused. Authorities say Caudill was at the cashiers counter but retreated behind the counter and a physical altercation began. Police say Caudill continued to physically resist law enforcement as she was arrested. She remains behind bars on $21,000 bond.